Everton have become the first Premier League club to solely use their women's squad to launch their new kit. 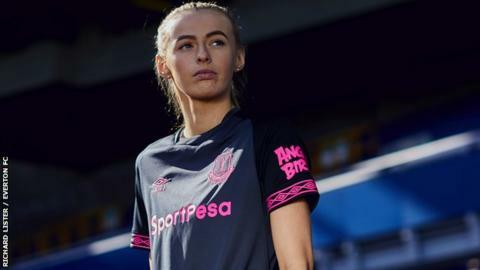 The Women's Super League side's Chloe Kelly, Megan Finnigan, Danielle Turner and Kirsty Levell featured in the Toffees' away kit release on Thursday. The move came as part of the #WhatIf social media campaign, launched by the organisation Women in Football in May. "I am delighted to be a part of this ground-breaking, inspirational campaign," Everton captain Turner said. "To be the first women's team to be given this opportunity is a real reflection of Everton's one-club philosophy and their commitment to growing the profile of the women's game."